Hi and welcome to girltalk! 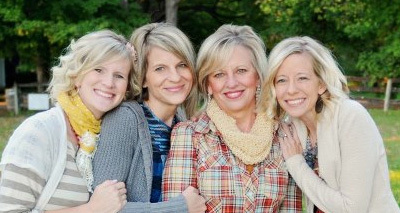 We’re a mom and three daughters talking about biblical womanhood and other fun stuff. Think of this site as your seat at Mom’s kitchen table. Here we ask questions, share advice, receive grace, and talk about how God’s Word applies to our everyday lives as women (Titus 2:3-5). Here encouragement is always on tap and laughter overflows. Here we strive to honor Jesus Christ above all. So pull up a chair and join our little chat, won’t you? It’s bound to be a lively conversation. Carolyn Mahaney is the happy wife of CJ (senior pastor of Sovereign Grace Church of Louisville), mother to three daughters and one son, and grandmother to twelve grandchildren. Carolyn has spoken to women at many churches and conferences, but she’s happiest making game-time snacks for Dad and Chad, laughing with our entire family on Sunday nights, talking to her girls (of course! ), and giving treats to her grandchildren when they visit. Carolyn is the author of several books including Feminine Appeal, True Beauty, and True Feelings. Nicole Whitacre loves being a wife to Steve and mother to her two boys and two girls. If you want to talk to Nicole, you’ll have to catch her first. She’s always on the go, taking her kids to soccer practice or music lessons, supporting her husband in his doctoral studies, or renovating her family’s farmhouse. When she has time to sit, she enjoys reading Brit lit or a good mystery. Nicole is the co-author, along with her mom, of Girl Talk, True Beauty, and True Feelings. Kristin Chesemore and her husband Brian (“Pastor B” to all of us) have three strapping boys and one feisty little girl. When she isn’t cooking large quantities of food or running carpools, Kristin crunches numbers and balances budgets in her spare time. She also cares for the women in our church and helps to lead the women’s ministry. Her hobbies are cleaning her house and then cleaning it some more. Janelle Bradshaw is the baby girl of the family and has the mischievous personality to go with it. When we all gather at her home on Sunday nights, we sit under her salvaged Dairy Queen sign, play her vintage Pac-Man machine, or get a twist of candy from the dispenser by the door. With the help of their four lively kiddos—three girls and a boy—she and her husband Mike turn old and new wood into lovely homemade signs for the home. Check out their work at 52homeart.com.